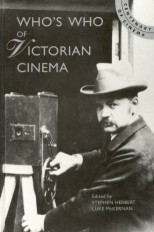 This section contains a number of special presentations on aspects of Victorian cinema. Follow the links on the left-hand menu for individual features. The full-size illustrations accompanying this essay are available in downloadable PDF format, requiring the free Adobe Acrobat Reader. Click on the high or low resolution images at the end of a paragraph (please note that the high resolution files are quite large and may take a while to download if you do not have a broadband connection). 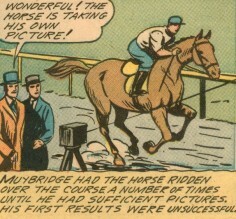 Popular culture has occasionally attempted dramatic reconstructions of the origins of motion pictures. In the movies this most notably resulted in The Magic Box (1951), the story of William Friese-Greene, ‘Inventor of Kinematography’. Most other attempts to make feature films about the very earliest moving picture pioneers have failed - including several tries to bring to the screen the dramatic story of Eadweard Muybridge. The old chronophotographer has, however, provided the material for an opera and at least one play. The comic strip and comic book world provides us with a wider range of examples. 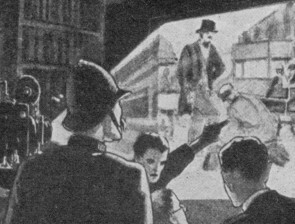 From the 1930s, as the myths about the invention of the cinema grew, several accounts were illustrated with artists’ impressions of the moments of triumph enjoyed by Friese-Greene, the Lumières, Edison - or whoever was being lauded as the ‘onlie begetter’. 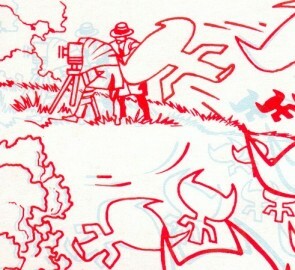 These drawings ranged from single pictures to short strips, to full-blown comic books. The interpretation of those mythical moments of the genesis of the movies - some based largely on fact, others a concocted amalgam of real and imaginary incidents - are interesting as they illuminate for us the thinking of a particular period, and/or culture. In this short article for the Who’s Who of Victorian Cinema, I have brought together examples from different periods, and different cultures. 3. Emile Reynaud’s Théâtre Optique is a favourite subject for picture stories of the beginnings of cinema, but the subjects shown on the screen within these representations are often imaginary. Although this musketeer swordfight scene (from Ernest Coustet’s Le Cinema, Hachette, c.1914) gives a good impression of the possibilities of Reynaud’s unique procedure - repeated actions such as swordplay could be usefully manipulated, the same few frames being wound to-and-fro to produce extended action from a short sequence - I don’t think any such scene appeared in Reynaud’s actual cartoon productions. 4. 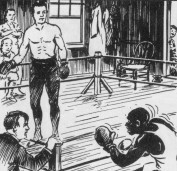 Thomas Edison’s story has been told many times - there are over 100 biographies - and selected elements have been the subject of cartoon strips. These panels are from Edison: Inspiration to Youth by Arthur J. Palmer, a paperback published by Thomas A. Edison Incorporated, copyright 1927. 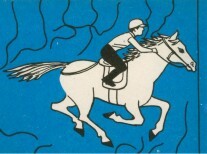 The examples are taken from an edition printed as late as 1954. Edison dreams of the possibilities of ‘talkies’, which were very much in the news when the strip was first published. 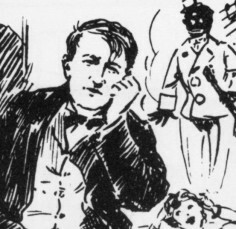 He is the shown in his shirtsleaves, trying to make motion pictures on a cylinder - a historically-accurate scene technically, although in reality of course the actual work was done by Edison’s assistants, in particular William K.-L. Dickson. Edison then recognises the importance of continuous film. 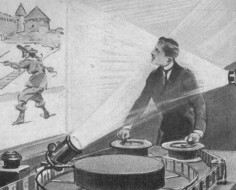 The next panel shows an Edison Projecting Kinetoscope, a motion picture projector of around 1900 - followed by details of film production in the Black Maria Kinetograph studio. 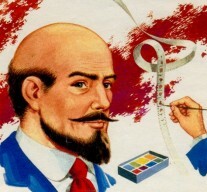 In reality, the projector was introduced after the Black Maria had been abandoned; the Kinetograph films were originally shown in peepshow Kinetoscopes. Was this version of events - with no mention of the short-lived peepshow machine - a deliberate attempt to eliminate this aspect of the story; and if so, was this for narrative reasons, or a ‘whitewashing’ of the dead-end Kinetoscope venture? Do you have a favourite painting or drawing of a scene from the cinema’s earliest days? If so, send it to us - together with your observations - and we’ll try to include it in an expanded version of this article. 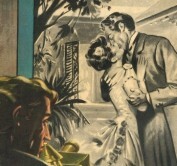 The illustrations in this article remain the copyright of their respective publishers and creators, and are reproduced here for purposes of review.